Alex is not happy about being sent to his grandparents’ retirement community while his parents go on a fabulous vacation. What could be worse than tagging along to Grandma’s boring bridge game or enduring the sight of Grandpa’s dentures? But as the week goes on, Alex’s desperate emails to his parents turn into stories about ice cream before dinner and stickball with Grandpa. Before he knows it, Alex has made a surprising discovery: grandparents are way cooler than he thought! I guess I was thinking about my own experiences visiting my grandparents in their retirement village in Florida back in the Seventies. There were so many activities for the residents to do! I thought it would be fun to put Alex (and his siblings) there, and to have Alex slowly come around to the idea that his grandparents are pretty fun to hang around with. 3) Why did you pick this genre? I love writing for kids. I write for older children as well as toddlers and elementary age kids. Probably because I’m a kid a heart, myself! And kids are the best audience. The illustrations, done by the wonderful David Catrow, really add another dimension to all the “I Wanna” books. Dave just seems to know how to be funny and he makes my words look good! The right illustrator can make or break a book, and I feel very lucky. I love knowing that people — especially kids, parents and grandparents — are enjoying my books together. 6) What do you hope children will take away with them after reading your book? I hope they learn that people don’t get boring just because they age. Maybe they will enjoy time with their own grandparents. 7) What advice do you give to aspiring writers at your adult workshops on how to succeed in this highly competitive market? I always tell people to just keep writing, learning, and improving. If you stay at it and learn your craft (and keep submitting) you will eventually find success. 8) School visits are a big part of your writing career. What are the benefits for you personally and professionally? It’s so great going into the schools and meeting the kids and teachers. It’s really my core audience! I have learned what they like and what they don’t; what they laugh at and what they don’t laugh at. I’ve learned so much by visiting and I’m always humbled when they applaud me! I would encourage every children’s author to get out and meet the kids in the schools. 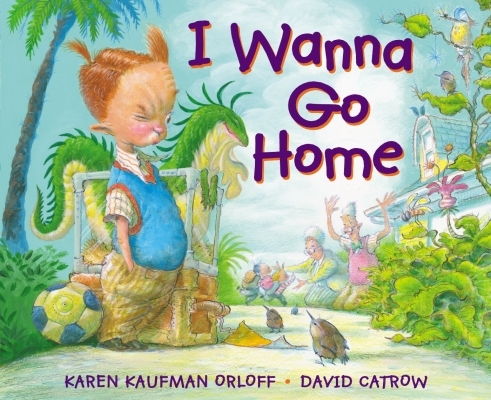 Should you wish to know more about Karen Kaufman Orloff and would like to purchase her book, here are all her pertinent details.